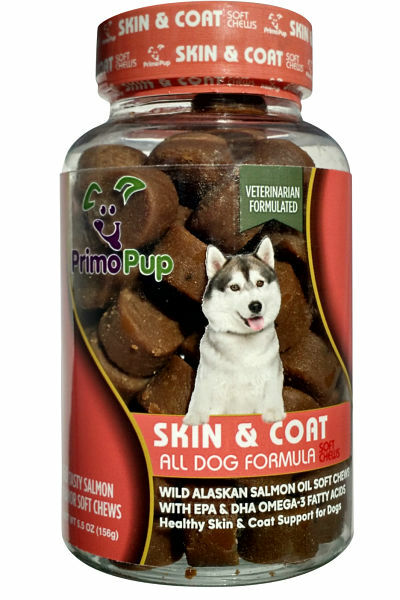 Primo Pup Skin & Coat Support for dogs formula is a blend of wild Alaskan salmon oil, EPA and DHA Omega-3 essential fatty acids to help animals achieve a soft, silky, shiny and healthy coat. 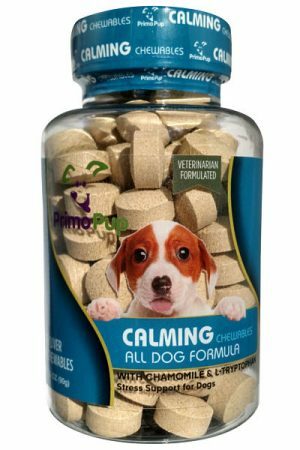 This veterinarian developed formula is made with quality ingredients in a facility meeting human consumption standards. 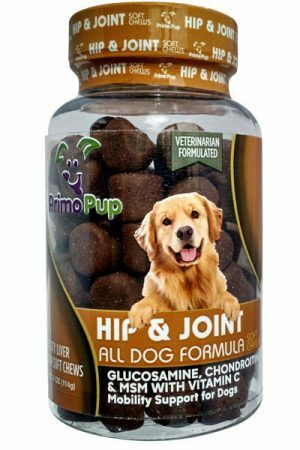 It is free of grains, artificial colors and artificial flavors and helps to support not only the skin and coat, but also the nervous system, cardiovascular system and joints. 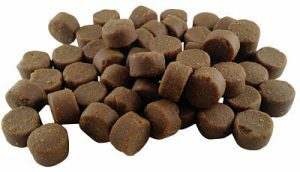 ⇒Tasty salmon flavor soft chews your dog will love like a treat! 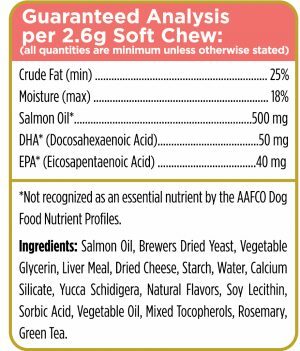 ⇒500mg of Wild Alaskan Salmon Oil offers highest quality omega-3 fatty acids available. ⇒50mg of DHA & 40mg of EPA, vital omega-3’s that are a primary structural component of the brain, skin & retina. ⇒Supports the skin, coat, cardiovascular system, central nervous system & helps reduce inflammation throughout the body. Our salmon oil is the highest quality available coming from domestic wild caught Alaskan salmon. Because fish do not produce the vital omega-3 fatty acids themselves, but rather accumulate them by consuming algae (or other fish who have consumed algae), the source of the fish oil is vitally important. 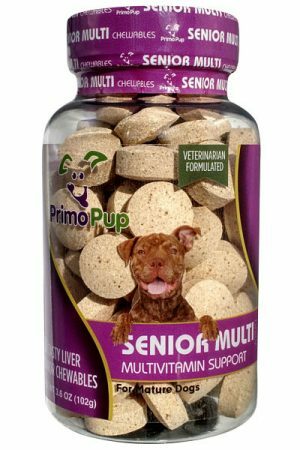 High quality fish means high quality fish oil that maximizes the benefits to the dog and comes with an added benefit of a higher quantity of antioxidants. DHA, known scientifically as docosahexaenoic acid, is a type of omega-3 fatty acid that is a primary structural component of the brain, skin, sperm, testicles, and retina. In fact, it comprises 40% of the polyunsaturated fatty acids in the brain and 60% of the polyunsaturated fatty acids in the retina. Further, 50% of the weight of a neuron’s plasma membrane is composed of DHA! DHA originates from photosynthetic and heterotrophic microalgae, making the source of this vital component very important. EPA, known scientifically as eicosapentaenoic acid, is another type of omega-3 fatty acid. It is a precursor to DHA but also offers many health benefits in addition to DHA. EPA is found in the flesh of cold water fish and from algae, again making the source of this vital omega-3 very important. What Effects My Dogs Coat? 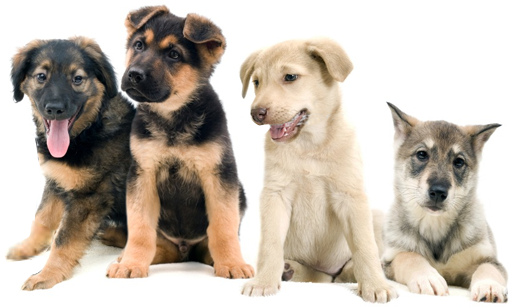 Both environmental circumstances (such as weather) & dietary aspects impact a dog’s skin & coat. Why Use A Skin & Coat Supplement? A soft, shiny coat is a visible sign of a healthy animal. 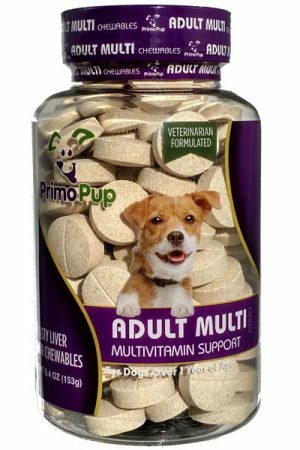 Primo Pup Skin & Coat supplements help a dog to achieve a soft, silky, shiny & healthy coat. How Does A Skin & Coat Supplement Help? 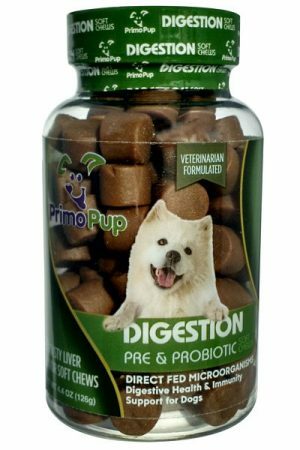 Primo Pup's Skin & Coat Formula provides an optimum blend of fatty acids & nutrients to support & maintain a healthy skin & coat. What Makes Skin & Coat Supplements Effective? Primo Pup Skin & Coat Formula is a veterinarian formulated blend of wild Alaskan salmon oil, EPA & DHA that provide Omega-3 fatty acids to support not only the skin & coat, but also the nervous system & joints. 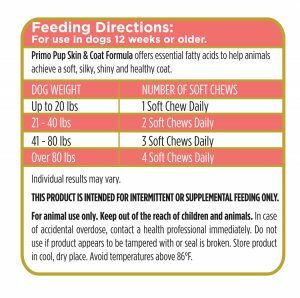 Are The Skin & Coat Supplements Tasty? 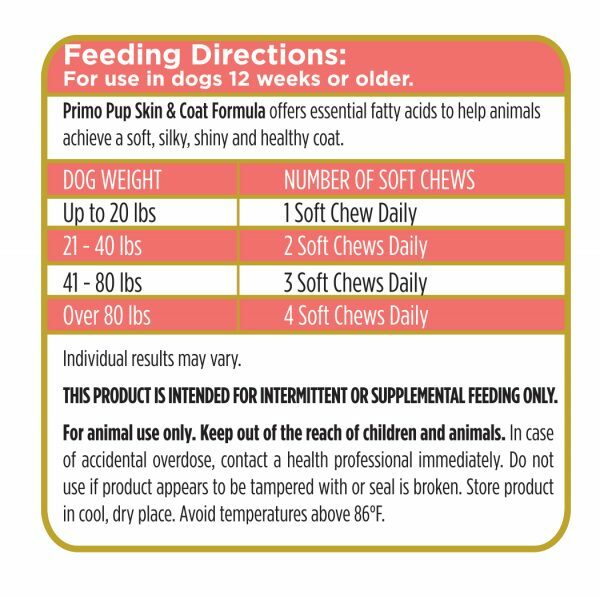 Primo Pup Skin & Coat supplements are salmon flavored soft chews. We perform extensive palate testing & find most dogs like them as much as their favorite treat. 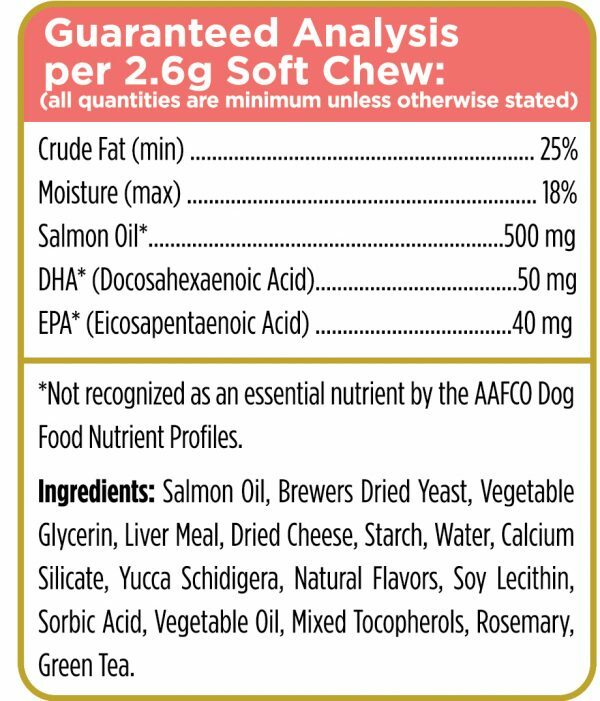 Crude Fat (min) 25%, Moisture (max) 18%, Salmon Oil* 500mg, DHA (Docosahexaenoic Acid)* 50mg, EPA (Eicosapentaenoic Acid)* 40mg. 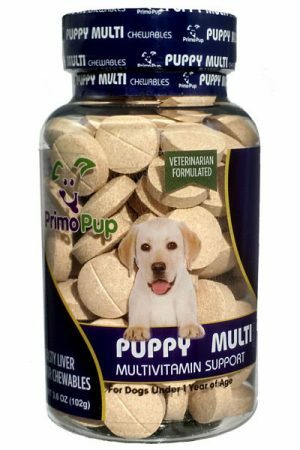 Salmon Oil, Brewers Dried Yeast, Vegetable Glycerin, Liver Meal, Dried Cheese, Starch, Water, Calcium Silicate, Yucca Schidigera, Natural Flavors, Soy Lecithin, Sorbic Acid, Vegetable Oil, Mixed Tocopherols, Rosemary, Green Tea.